Recently, I purchased a NodeMCU from AliExpress for about $4. The reason I did this was to find out what all the fuss is about with ESP8266. NodeMCU is an open source IoT platform. It includes firmware which runs on the ESP8266 Wi-Fi SoC from Espressif Systems, and hardware which is based on the ESP-12 module. Compared to the Arduino UNO, my ESP8266 totally knocks it out of the park when it comes to CPU power and price. The ESP8266 is 500% faster and 82% cheaper than the Arduino. 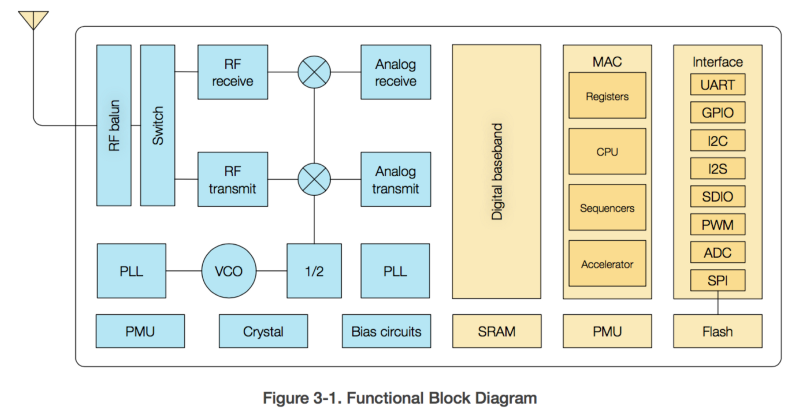 The ESP8266 also has WiFi connectivity. I was very surprised when I visited the Espressif website for the ESP8266. There’s lots of documentation and resources that you can use. 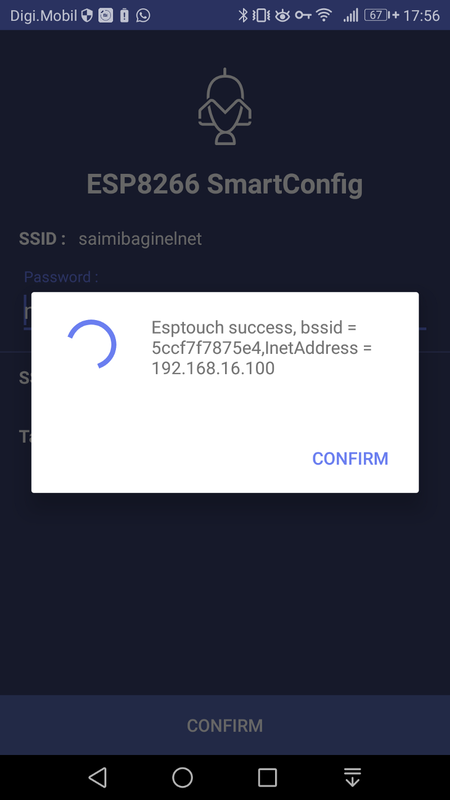 For example, there’s an Android application which tells your ESP8266 to connect to your WiFi. The app sends the SSID and password as packets, the ESP8266 sniffs them, and then it connects to your WiFi. This is called SmartConfig, and was invented by Texas Instruments. In this article, I will guide you to setup and run the Smart Config example from the Espressif RTOS SDK. To configure the DNS server, have a look at this example. 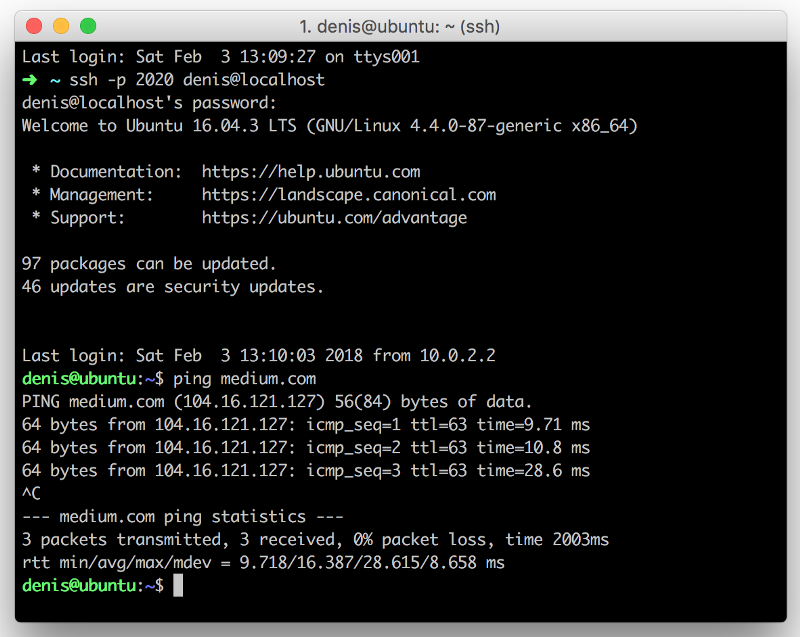 Example: dns-nameservers 8.8.8.8 8.8.4.4 If you can ping Google, then you’re good to go! 3. (Optional) Install OpenSSH and Samba server. This will make your life much easier. 4. 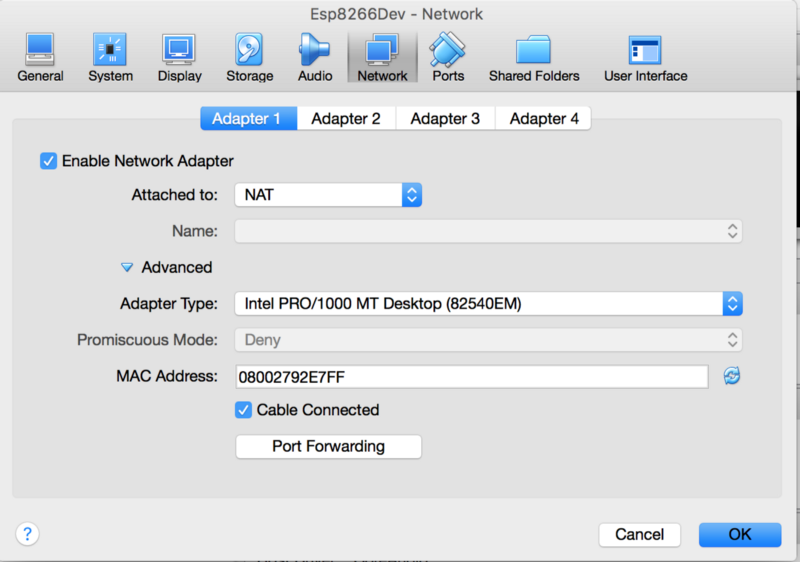 (Optional) Enable port forwarding. In order to SSH directly into your virtual machine, you need to enable port forwarding. 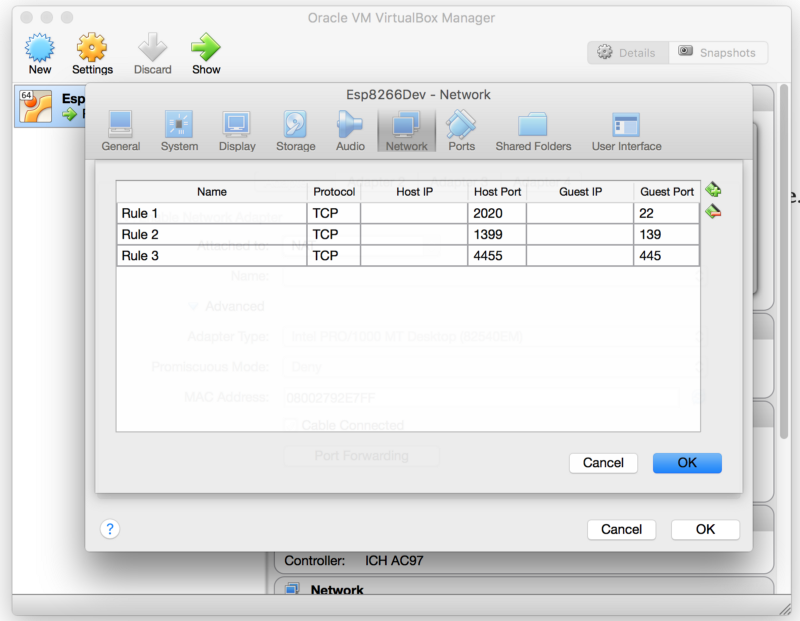 For example, to map the port 2222 on your host machine to the port 22 of your virtual machine. 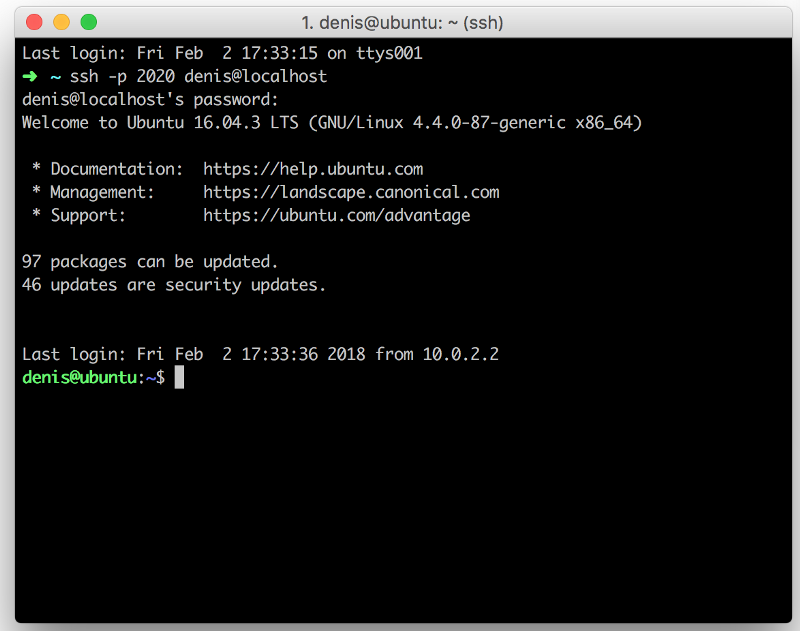 If you have enabled port forwarding, you can now SSH into your virtual machine from your Host machine as in the figure below. Note: If you’re on Windows, you need Putty in order to SSH into the virtual machine. This should reveal to you that the device has been identified as /dev/ttyUSB0. 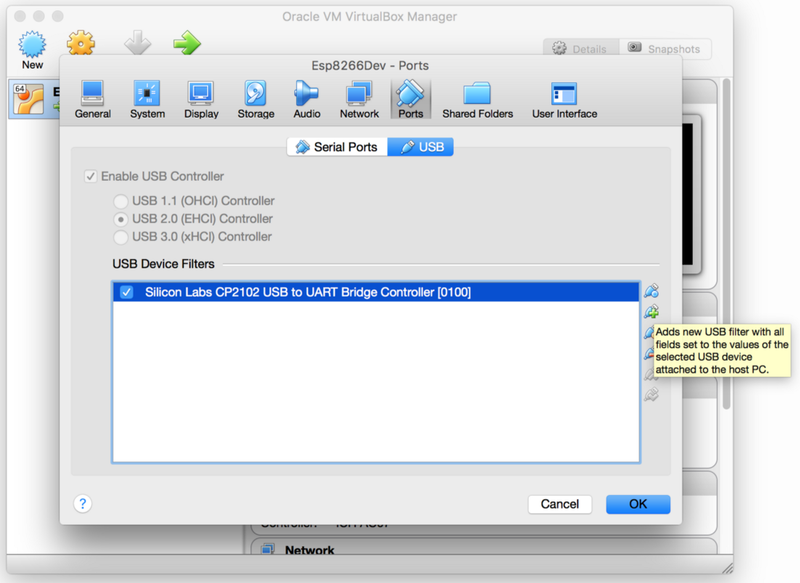 If nothing happens, then you need to add the USB to the virtual machine. After adding the USB, unplug and plug your device in again. 1.Install the required packages (as below). This info is also available on the SDK’s readme.md. Warning: This step will take a while to finish so please be patient. On my virtual machine it completed after 50 minutes. On yours it might take more or less, but before you run, make make sure that you’re connected to the internet and DNS is properly configured. The best way to check this is to execute a ping to Google or some other site if Google is blocked in your region. If your ping is successful, you can minimize the windows and watch an episode of your favorite TV show. Come back after about 40 minutes (but make sure your computer doesn’t go to sleep). If the command executes successfully, then you’re good to go! Plug your NodeMCU and run lsusb to verify that your device is connected. 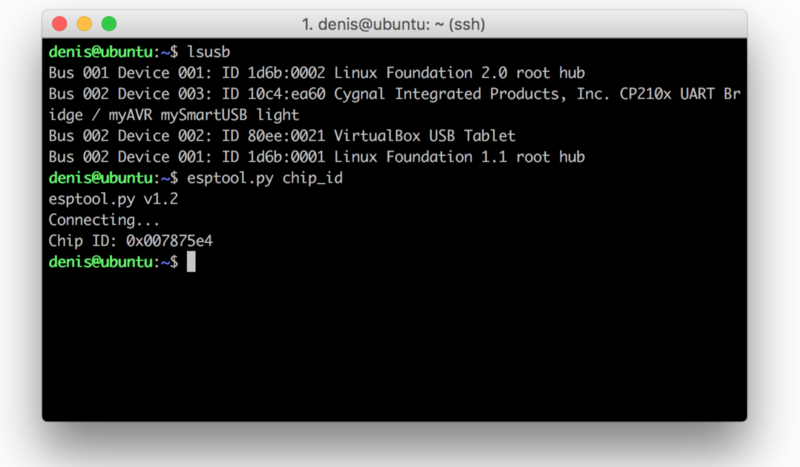 After that, run esptool.py chip_id. You should now see the board’s chip id. 6. Export the SDK path and SDK/BIN path using the commands below. Now, if you reset the board, you should see no LED blinking. Open the Application, make sure that you’re connected to a WiFi AP, enter your password, and press confirm. After a few seconds the ESP8266 should connect to your AP. That’s it. Congratulations for reaching the end! If you want to develop more using the ESP8266-RTOS-SDK, please visit the official websites. You’ll find a lot of resources and documentation there. Also, please take a look at the other examples found in the SDK folder.